The best manufacturers I’ve visited this year all share a common attribute: they are obsessed with making themselves as easy as possible to work with from a supply chain, distribution and services standpoint. 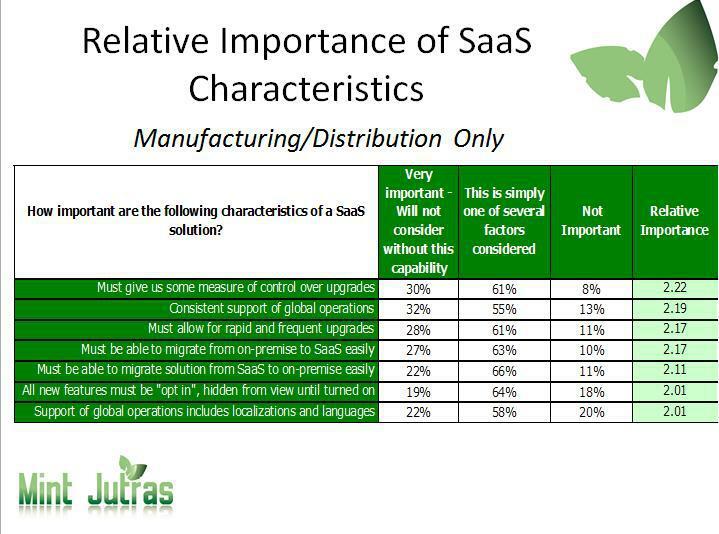 Many are evaluating cloud-based manufacturing applications including EnterpriseResource Planning (ERP) and several have adopted cloud-based applications across their companies. Increasing reliance on two-tier ERP strategies to gain greater efficiencies in material planning, supplier management and reduce logistics costs. Manufacturers are also using this strategy to gain greater independence from a single ERP vendor dominating their entire operations. Several manufacturers remarked that their large, monolithic ERP systems could not, without intensive programming and customization, scale down to the smaller operational needs in distributed geographic regions. Cloud-based ERP systems are getting the attention of manufacturers pursuing two-tier ERP strategies. Acumatica,Cincom, Microsoft MSFT -1.33%, NetSuite and Plex Systems are leaders in this area of ERP systems. Reliance on cloud-based Human ResourceManagement (HRM) systems to unify all manufacturing locations globally. This often includes combining multisite talent management, recruiting, payroll and time tracking. Contract manufacturer Flextronics uses Workday to optimize workforce allocations across their global manufacturing centers for example.